I am honest when I say that I am a bit torn with this book review. I have seen other reviews that weren't so pleasant and I don't think that this book was horrible at all...I have read bad books and they didn't keep my interest in the least, unlike this one. 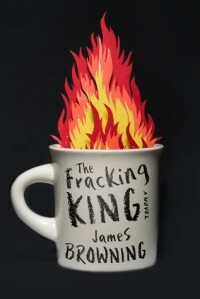 Basically this book is about a teenager, Winston Crwth (rhymes with truth), who is attending a boarding school on a scholarship provided to him by a gas company that is responsible for local hydraulic fracturing also known as "fracking". Luckily I knew what fracking was, otherwise, I would think that it could be a bit confusing as it isn't entirely explained in this book. Maybe that is why I didn't understand the very low ratings and reviews. I am sure that this book could be a bit confusing without some prior knowledge of fracking and its consequences on someone's health when the chemicals released from fracking mix in with the local water supply. In some ways, Winston reminded me a little of Holden Caufield from "The Catcher in the Rye" but I am not entirely sure why. Maybe it was the whole coming-of-age and trying to fit in although he wasn't cocky like Caufield and definitely wasn't sure of himself. This story was great in how it was able to grab my interest and hold it until the end. I will admit that at times during the end I didn't know really what direction this story was headed toward or the message that it was conveying. Was it about fracking, anti-fracking, or about a kid trying to find his voice? I don't know and I can see how that can be frustrating for readers. Although in the end I am still not sure where the book was heading or its seemingly arbitrary message (although I am pretty sure it isn't meant to appear arbitrary), and I didn't find the other character's in the book to be very developed, I found it interesting enough to really not care. I felt mainly like I was learning about Winston and following him through his journey of ups and downs. Winston is consumed with Scrabble and has been playing it since he was about 4-years-old. He sees everything in terms of tiles and scrabble boards. He cannot even read an article without first viewing it as he would a Scrabble board. I found this important in Winston's development in the story but it did become a bit redundant to me in various parts of the story and this was my personal hangup but it was minor really. I would recommend this book if only to be curious of various opinions and to help me piece it together, but if you do and don't know much about fracking, then I would highly recommend polishing up on this term. I actually would recommend getting to understand this term regardless of whether you choose to read this book or not!